Navitime was a revolutionary service and the undisputed king of Japanese navigation prior to the introduction of smartphones. However, they've had trouble shedding their galapagos heritage in order to offer a product that not only works, but also has realistic pricing, given the ever growing functionality of both free and ad-supported competitors. The basic problem was that, until recently, they only offered an all-in-one app that didn't even run unless you registered for their web service and paid ¥315 per month. Now, there are several new apps available. 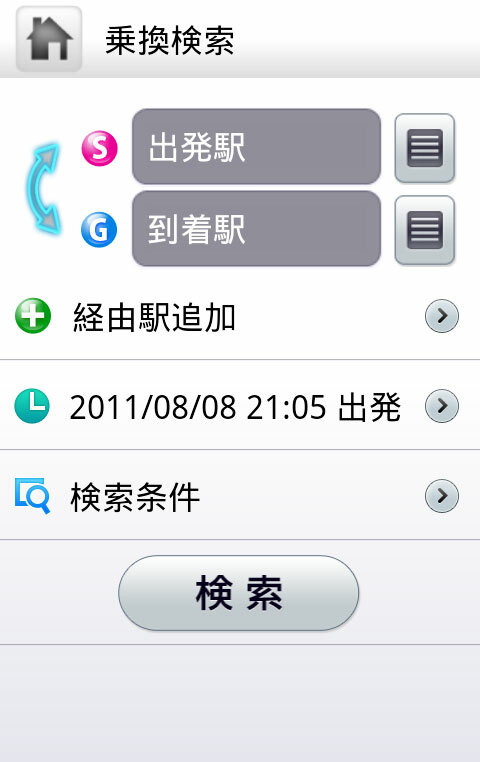 The main app can be started and used without authentication, though most of the features won't work. More importantly, there is now a stand-alone train transit and car navigation app. Of these, only the train transit app is fully functional without a subscription, so here's my quick and dirty review of it. Extensive database with elevator, escalator, wicket, carriage numbers, exit numbers, etc. Good: Offers several features that are not present in the other 乗換案内 apps. Notable: First Navitime android app to achieve at least a 4 star rating. It also allows you to save routes, as opposed to individual stations, which in theory should allow one click schedule retrieval. All other apps I am aware of simply store individual stations. 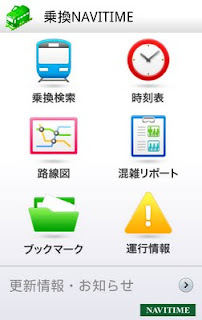 In addition to GPS, a common feature on other apps, it also includes an interactive transit maps (for Tokyo trains, tokyo Subways, Kansai, and Nagoya) that can be used to select stations, a function that no other apps offer. It has crowd-sourced "crowding" information with several ranks, ranging from plenty of seats to sardine can. It feels a lot less like it was designed for an i-mode feature phone, but could use a stronger UI makeover. Navitime includes a feature that quickly alerts you if your morning route is experiencing delays, which is particularly useful for anyone who clocks into work at the same time every day. 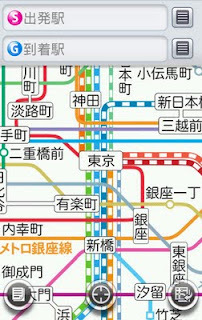 Unfortunately, it is mislabeled as a "Bookmarked Route" and is inaccessible from the standard delay information menu. Routes are saved with departure/arrival times. Specifying a different time requires first searching the saved time, and then redoing the search with a newly specified time. This is great for a salaryman, less so for someone who doesn't take the exact same train at the exact same time everyday. The same is true for station bookmarked schedules, though not for schedules when viewed from search history. Being version 1.0.1, I expect this stuff to get better, though don't be surprised if ads creep into subsequent versions. Sometimes a schedule is saved at the proper time, other times not. I have some stations that saved at the exact time I tried to set, others that got set to random times, and still others that are set to the current time when I performed the search. Only one hour's worth of departures are displayed at a time and displaying more requires mashing an often unresponsive up or down arrow. Sometimes, but now always, the entire day's schedule simply won't display. Deleting bookmarks doesn't always work properly. Often times the bookmark will be deleted, but still appears in the list. Clicking it brings up an error message. After a while, something seems to trigger removal of the deleted bookmark from the list. Normally a local database would probably in the the long term consume less bandwidth than downloading individual results, but since 3/11, Tokyo train schedules have been in a constant state of flux. The database must be updated more often. 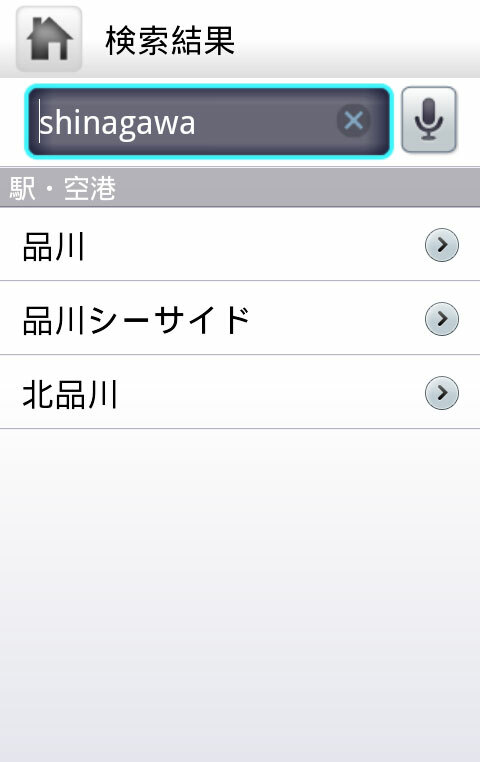 While it doesn't include English menus, you can enter station information in romaji. 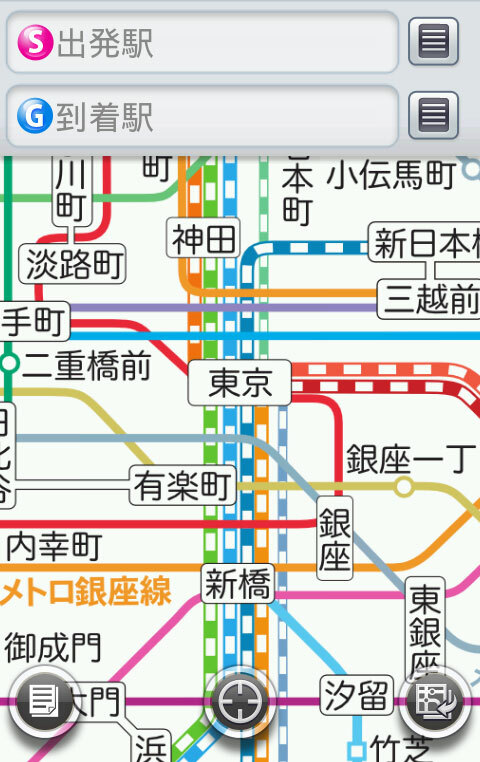 Interactive Tokyo subway map. 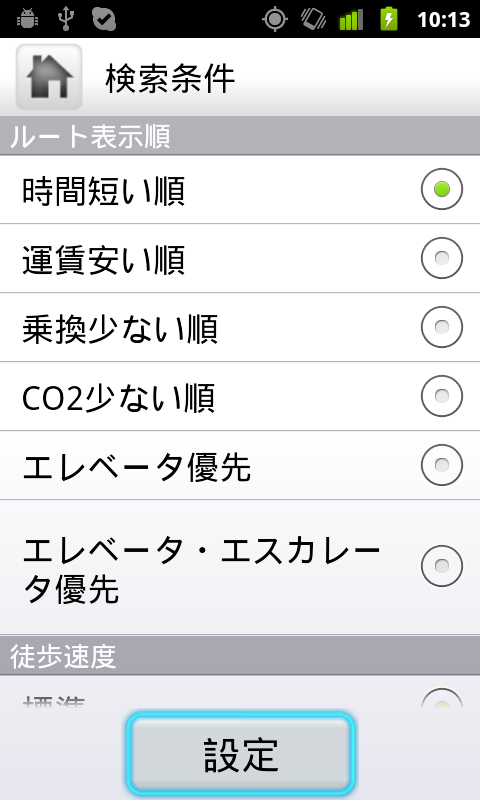 Other downloadable options include Tokyo, Nagoya, Kansai trains. Left button brings up the option for selecting a connecting station. Middle button selects closest station based using GPS, etc. Right button switches between maps. Schedules can be displayed via lines. Here's the list of major options, ordering by time, cost, number of transfers, carbon emissions, elevator location, elevator and escalator locations. 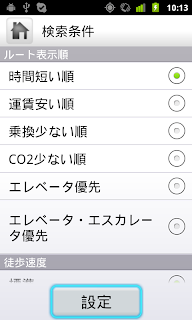 it's a little weird that it outputs a list of options when you go for "least number of transfers" but skips straight to only one route for the "fastest"...but whatever, makes sense in a way, i suppose...I've been using 駅探・乗換案内 lately, but i'll give navitime a try for now. Thanks for reminding me about that. I had relied on navitime (rebranded as AU EZ Walker) for years and was really disappointed at first that I couldn't use it on Android. But I am a little worried for them. Perhaps this is too little too late. If Google expanded their database to include car numbers and the locations of escalators, etc., There really would be little reason to pay for navitime. Hopefully they smash some of these bugs sooner than later. Saving schedules is essentially broken for me. Huh? I used Navitime's Android app for 乗り換え案内 without paying a yen for over half a year from January to July (back in Europe now though) so I'm not sure this qualifies as a "recent" addition. It works well enough and I prefer it over other apps but it is HUGE and accessing the station history was really slow on my Acer Liquid. I'm not aware of navitime releasing an app by that name, though I admittedly haven't been paying too much attention to them. 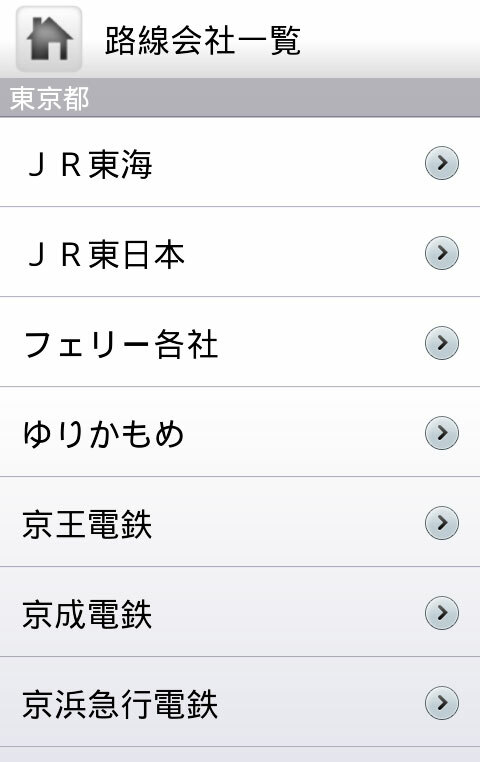 乗換案内 is the name of both the ekitan and jorudan app. Jorudan has a similar green theme. Maybe you were using Jorudan? Or Maybe you're talking about the fullsize app, the one that is similar to google maps, with turn by turn walking directions, etc.? That got updated in April 2010 (press release E). Prior to that was the one that wouldn't start without logging in. 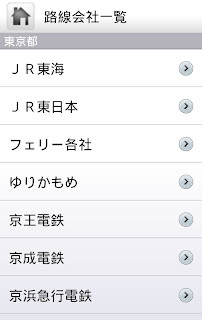 The app I'm talking about here (乗換Navitime) was released on 7/1/2011 according to this press release (J).